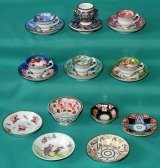 Two of the foundation stones of the British Ceramic Industry were laid by Josiah Spode - underglaze printing in blue on earthenware and the development of bone china. 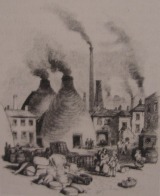 Spode I was the first potter to install a steam powered grinding mill in 1779, he led a team of contemporary potters to form companies to mine coal in 1790, and china clay in 1799 so uniformity of supplies could be maintained. A rare Spode Porcelain Coffee Can and Saucer c.1820, French shape, decorated in "Shell moonlight lustre" decoration, the border exquisitely painted with floral pattern, gilded handle. Dimensions: can 6.2 cm high x 6.5 cm diam, saucer 13.2 cm diam. Condition: can with hairline crack, the saucer in fine condition. Painted pattern 1194 in red on the base. 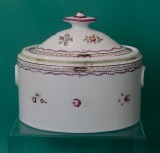 A Spode bone-china Sugar Box and cover c.1800-1805, in "Old Oval" shape, enameled with floral pattern in Chinese export style. Dimensions: 12 cm. high x 15 cm. Marks: impressed "78"(the cover) and 98(the box). Condition: minor staining and ware on the enamels. 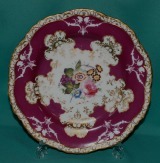 A Spode Porcelain Dessert Plate, pattern 4130 c.1825-30, with elaborate moulded border, the centre hand-painted with garden flowers on crimson ground and fine gilding. Dimensions: 23 cm diam. Printed marks in puce, pattern 4130 in red on the base. Condition: minor ware. 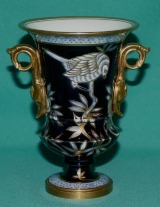 A Spode Dolphin Tripod Incense Burner c.1815, finely painted in Imari style, pattern 967. Dimensions: 13cm. high. Marks: 967 in gold, workmen's mark in red. Condition: missing lid. An Early 19th C Spode Porcelain Centre Dish, Pattern 2010, c.1820, of rectangular form with shaped sides, indented corners and twig handles with foliate terminals, decorated with moulded flowers on pale lilac ground and painted with flower sprays in the centre. Dimensions: 13"(33cm) x 8.75"(22cm) x 2.75"(7cm) high . Marks: Spode 2010 painted in red. Excellent condition. 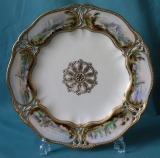 Two Spode porcelain dinner plates, c.1820, each painted with strawberries in the centre, the border decorated with embossed flower sprays on pale lilac ground, gilded rim. Dimensions: 25 cm diam. Marks: Painted "Spode" in red on the base. Fine condition. 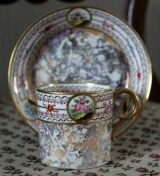 A Spode porcelain trio, comprising a coffee can, bute shape tea cup and saucer, Pattern 1645 c.1815, painted in imari style. Dimensions: can 6.5 cm. high, cup 6 cm. high, saucer D.14.5cm. Marks: Spode 1645 painted in red. Fine condition. Pattern number D 1634 in red, inscription, printed diamond registration mark and Copeland in underglaze blue, impressed letters. Dimensions: plates 23cm diam. comport 24cm diam. x 15cm high. Condition: Two plates cracked. A Copeland Porcelain Plate with pierced border, the radiating six panels depicting castle scenes, painted in enamels and gilt. c.1870. Minor ware on the gilding and fine crazing. Impressed marks. A Copeland & Garrett botanical dish c.1835-40, painted with a flower study in the centre on a tan ground border. Printed marks: Copeland & Garrett, Late Spode, Felspar Porcelain; Inscription: "Osveckia Glomerata", pattern C 5325. Fine condition.